In a sauce pan over medium heat, combine sugar and water. Stir until well mixed. Then allow to bubble up. Remove from heat when mixture turns into a deep amber color. Add heavy cream and butter. Whisk until smooth. Add sea salt and continue to whisk. Set aside. Squeeze lemon juice into a large bowl. Core the apple, peel, and cut into thin slices. Mix in the bowl with lemon juice. Add granulated sugar. Continue to mix and toss thoroughly. In a collander, pour apple slices to drain juices for around 20 minutes. Then place apples back into large bowl. In a separate bowl, combine flour, spices and raw sugar. Sprinkle flour mix over drained apples. Stir to coat apple slices as best as possible. Pour apple on pie crust. Pour salted caramel sauce on top of apple slices. Arrange criss-cross top over apple slices. To make the top crust shiny, use an egg wash. Sprinkle raw sugar. Bake in oven for 40-50 minutes or until crust is deep golden brown. 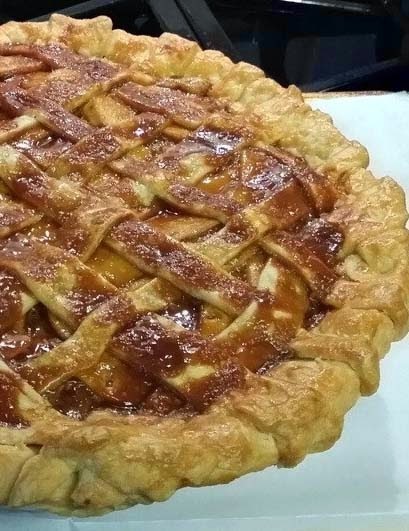 There are two video directions to watch for this apple pie recipe: first video for putting together the pie itself and a second video for the salted caramel sauce.